The Minister of Defence, Hon. Addo-Kufuor has refuted claims by the 'National Democrat' newspaper that he (Addo-Kufuor) sent gun-totting soldiers after its editor, ostensibly to lock him up. 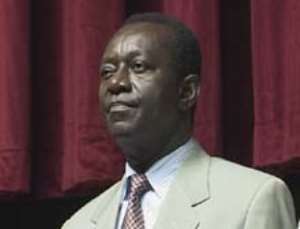 Narrating the circumstances that let to this unfortunate incident, Dr. Addo Kufuor stated that his attention was drawn to a story in the 'National Democrat' alleging that “he is the largest importer of rice in Ghana by virtue of the Armed Forces Procurement system, which the minister had hijacked! The defence minister explained that they placed a call to the newspapers office and booked an appointment with the editor, but on the appointed day, the editor was nowhere near his office. Dr. Addo Kufuor stated categorically that he had never ordered soldiers to manhandle any civilian in his position as the Defence minister. He also stated that it is rather the Minister of Agriculture, Major (rtd) Courage Quarshigah who is in charge of importing rice for the military. “I swear by my mum that I've never imported rice into this country before. I don't even know the procedures involved…it is my good friend, Courage Quarshigah who is in charge of that”, he said.